When Center Stage theater moved into the former Loyola College and High School on Calvert Street in Mt. Vernon, the building had been vacant for decades. The Catholic school was built in 1899 to fill out a campus owned by the religious order the Society of Jesus, which previously had erected St. Ignatius Church at the corner of Madison and Calvert Streets and needed more space than its basement could provide to offer schooling for Catholic youth. The high school and college occupied the site until 1922, when they split into separate institutions and moved out. And the building went largely unused until 1975 when Center Stage moved in. 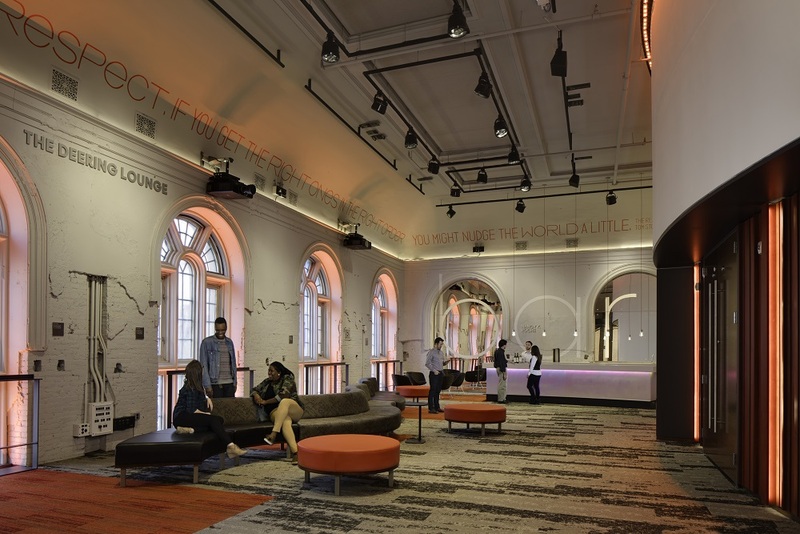 Updated and redesigned several times over the last 40 years, the most recent work at Center Stage was a $28 million extensive renovation that was completed two years ago. The work included transforming the main entrance, renovating the theater as well as non public spaces like the dressing rooms, and adding a new 5000 square foot costume shop and education center. Please join us as we learn how a modern theater flourishes in a century old building with a backstage tour of Center Stage, including a visit to the costume shop in action.